These are known as different things to different people. I know them as the the wrecks, others call it the ships graveyard while the official name these days appears to be the hulks. 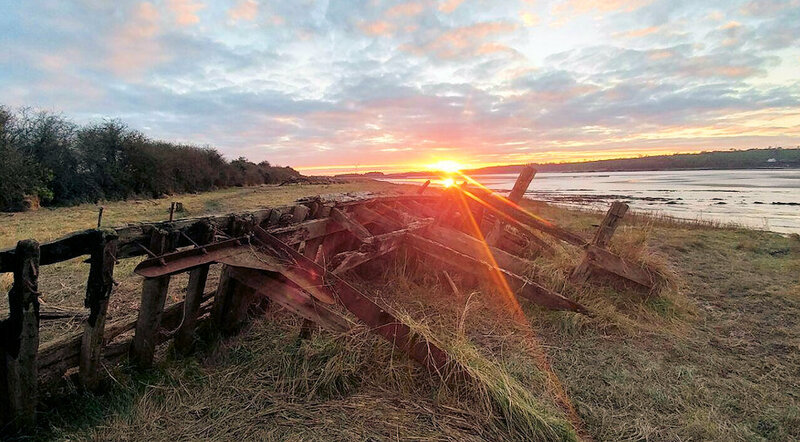 The hulks can be found on the banks of the river Severn at Purton, which is between Slimbridge (well known for the wetlands trust) and Sharpness. The river and the Sharpness canal pass very close to each other at this point and it was noticed that high tides were washing the small piece of land between the canal and the river away so something was needed to prevent further erosion. The idea back in the 1950s was to shore up the banks with large old boats that were towed across the river with a tug that then detached itself from them near the shore. The old vessels then carried on into the bank. They were allowed to fill up with silt and water to kept them in position. 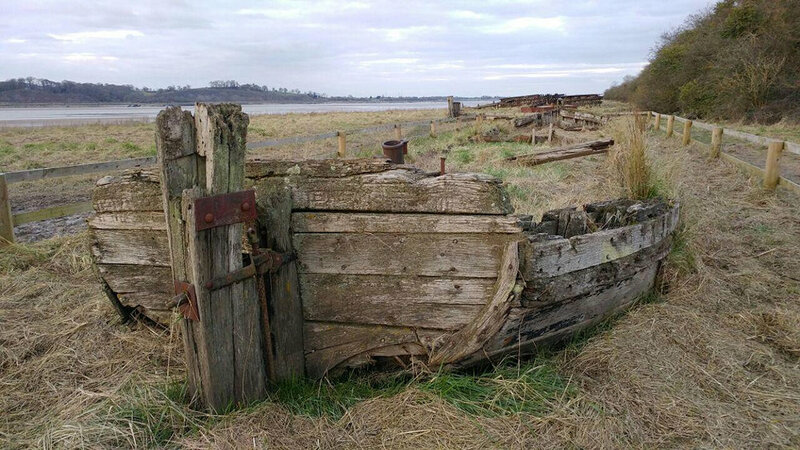 Some also had holes cut into them to help the process as the river Severn has the second largest tidal range in the world at 48 feet, although I think it’s probably a little less at Purton as the river is so wide. 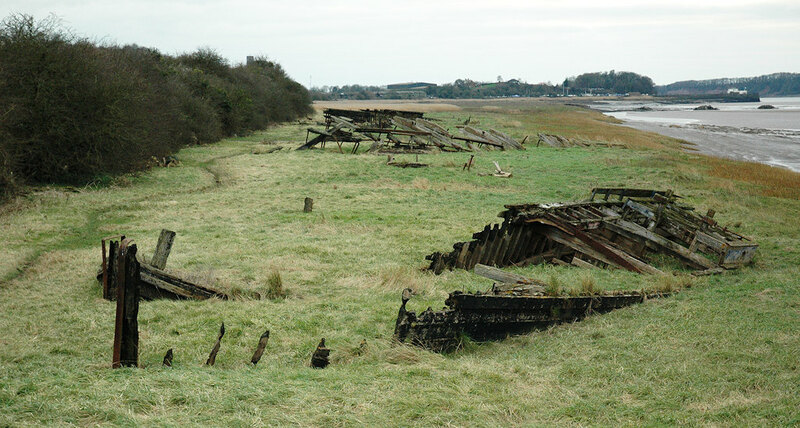 Purton Hulks. This one now has fence around it to stop it escaping. The old vessels were a mix of old Severn trows, some concrete barges that were built in Newcastle and various others. Severn trows were essentially wide beam narrow boats that could navigate the Stroud water canal up to the port at Brimscombe. The canal further on up the valley was too narrow for them so they would unload their cargo into smaller narrow boats, or the other way around depending on the direction they were going in! One of the recently still floating concrete barges was preserved by the waterways museum at Gloucester docks but was later towed down the canal to Purton as it didn’t fit in with the new housing being built in the old dock warehouses as it wasn’t pretty enough. Concrete barge that’s since sunk in the Sharpness canal. Being a shipping canal it’s deep..
Out of site and out of mind, they didn’t look after it properly and it eventually filled up with rain water and sank in the deep canal. It’s still there and has some buoys marking its position. Concrete Barge. It’s full of Severn mud and isn’t going anywhere anytime soon! 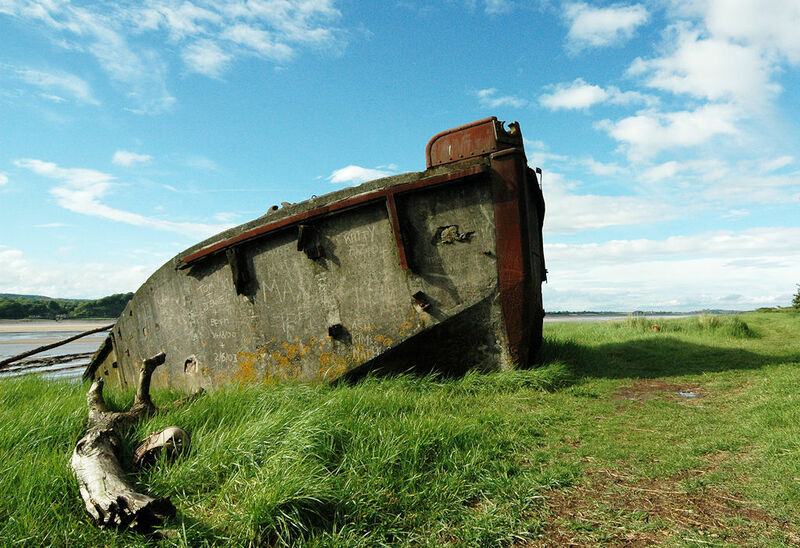 There are a couple of other concrete barges of the same type within the historic wreck site. One of the larger vessels. 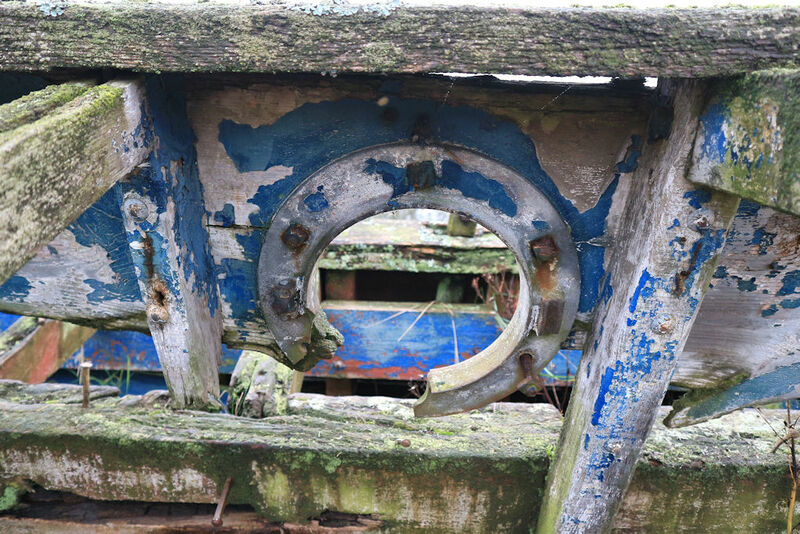 The spikes in the foreground are part of the timber beam that forms the keel. The sides have a lot of fire damage from vandals but it gives you a good idea of how it was constructed. 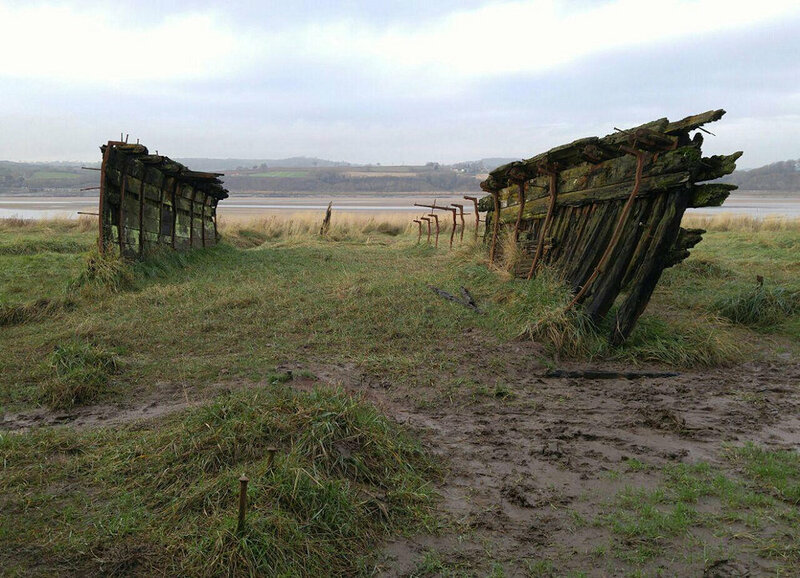 Over the years the hulks have gradually disappeared into the mud. They haven’t sunk into it, the mud and silt has just built up around them over the years with some of the smaller ones being completely covered over. There are now small name plates put into the ground telling you the names of each one and information about where it was made, it’s size and weight etc. One now has a fence around as its been granted ancient monument status. The wooden ones have suffered vandalism over the years with people setting them on fire and they have been used as a source of firewood for the nearby houses, apparently. 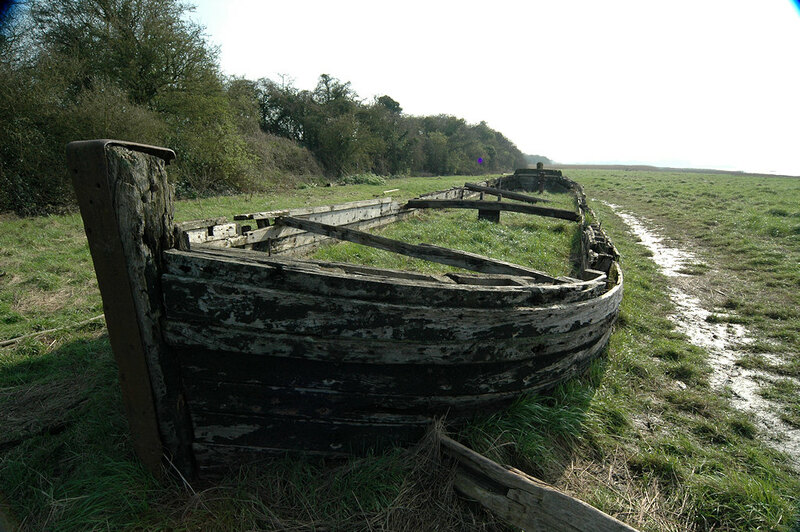 I went to a talk about the Purton site at the museum in Stroud and they showed a photograph of a large wooden vessel with a doorway cut into the hull as it was used as a changing room for swimmers. Its long since been taken apart covered with river mud. If you want to visit, Purton is off the A38 near Slimbridge and there is a free car park opposite the church. You will need to walk along the canal path from the car park to get to the hulks which will probably take less than ten minutes. Photographs are copyright and may not be used without permission. If you have any old photographs of the hulks and would like to see them here please contact me via the contact form.